Even during our initial build, current events like the PanAm Games Toronto Sign work their way into our exhibit proving our commitment to making OHML truly Canadian past, present and future. It was also a great opportunity to reach out to you, our fans, who are always generous with ideas, feedback and insight. As Toronto’s celebrated Pan Am games came to a close in July 2015, a very big and illuminated “Toronto” sign was left behind on Nathan Phillips Square. It had officials scratching their heads, wondering what to do with it. At Our Home and Miniature Land, we decided to do a little sign searching ourselves and went to the polls. We recreated the sign and placed it in front of our own version of St. Lawrence Market, The Air Canada Centre, and Union Station. We also put it on the Prince Edward Viaduct Bridge and the Roundhouse at the foot of the CN Tower. We then held two polls on Facebook and Survey Monkey, and asked people where they think the PanAm Games “TORONTO” sign should go in Our Home And Miniature Land. The result? People responded with definite clarity as Union Station emerged as the clear winner with over 70% of votes on Survey Monkey and 43% on Facebook. 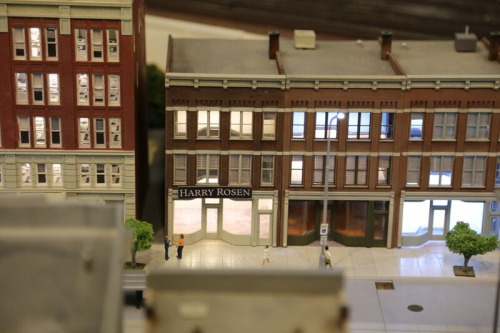 Chris Bateman of Toronto Life wrote a great article released on September 24th entitled "A close-up look at a ridiculously detailed scale model of Toronto". His article gets in depth including images with pop-up details of the different facets of our exhibit. City lights can be a mesmerizing sight with a glowing skyline showing a city alive, vibrant and full of activity, even during the night. It was important for us to try to capture this feeling with the miniature skyscrapers in our layout. Each building is unique in how it was constructed and required unique approaches for lighting. We were able to control the lighting of each individual building by having separate strands of LED lights on their very own circuit board. This allowed us to control the lighting activity of each building. Now when night time descends on Our Home and Miniature Land, almost 20,000 lights give our patrons the feeling of viewing a real city skyline. Only smaller. Bring your family and friends to another open house. Your visit will include the competed Toronto exhibit, as well as Hamilton which is still under construction. Looking forward to seeing you soon. We look forward to seeing you at Our Home and Miniature land.